New Zealander Bryce Lawrence is a former school principal who took up refereeing in 1994 and has gone on to take charge of some of the biggest games in rugby. The Bay of Plenty native followed in his father Keith's footsteps by becoming an international referee, making his first Test appearance in the 2008 clash between South Africa and Australia in the Tri-Nations. He had previously refereed the season's Super 14 semi-final between the Waratahs and the Sharks and took charge of the Air New Zealand Cup final. The biggest match under Lawrence's belt was the first Test between South Africa and the British and Irish Lions in 2009. The New Zealander came in for criticism from the Lions coaching team after Tendai "The Beast" Mtawarira took Phil Vickery apart at scrum time, leading to a number of penalties being awarded that cost the tourists dearly. 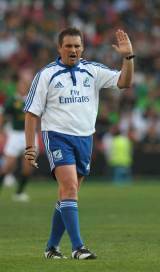 Lawrence was on the touchline as assistant referee the following week as the Springboks clinched the series. His first Six Nations game saw France clinch the Grand Slam in March 2010.